We provide an active balanced programme of indoor and outdoor activities for young people (boys and girls) between the ages of 8 and 10½ during term time on Tuesdays between 6:10pm and 7:30pm and Mondays from 6:30 to 7:45 from our hut at the end of Flamsteed Road. Young people typically join us for a few weeks while they decide whether they want to be invested as a Cub. If a boy or girl would like to join us, please use the Akela email address to add your name to the waiting list for either pack. The Monday cubs are the Monsoon pack, and the Tuesday pack are known as the Typhoon pack . If your child has been for a few weeks and has decided they would like to be invested then Akela will talk to them. There is a leaflet about it available here as a Word document, or online here. 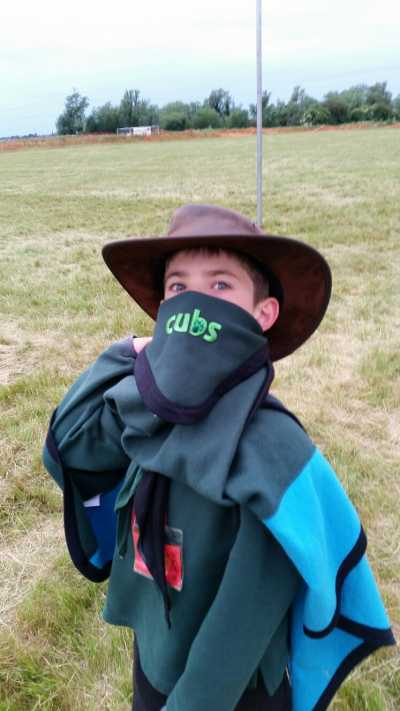 Once invested, they will need a woggle (provided by Akela) and both a neckerchief (ours is green and black) and a cub shirt from the scout shop on Perne Road; your cub may need the badges page to help sew on all their new badges. In a typical evening the pack would start with Grand Howl, we would enjoy a game or two, have some fun towards an activity badge and learn some background scouting skills like working with maps, tying new knots to help make things or rudimentary first aid. We usually organise a couple of camps each year, with the main one typically happening during the start of the summer holidays. Both packs usually camp together. The Summer Camp usually has a theme, such as American Indians, the Dambusters or Ancient Britons. Other camps we have been on include backwoods cooking at Abington Campsite and Cherry Jam for the scouting centenary. At camp we do adventurous outdoor stuff like kayaking, chariot building and racing, abseiling and zip-wires and quieter stuff like sitting round the camp fire after dark in a camp blanket (just a wool blanket, but often embellished with patches or clever designs) toasting marshmallows. With two active cub packs we need some help in overseeing the activities. Some of our leaders are only able to attend for part of the term. Extra help from parents, carers or anyone interested in becoming a leader enables us to do more focused small groups, and gives an opportunity to see the reality of a cub evening. Please email or sign up in the hall if you can help. Please can you sign up to attend as a parent helper for at least one session each term. The chart of dates is on the board in the entrance hall of the scout hut.